On Thursday AM the violet blue blend socks were 4 inches. 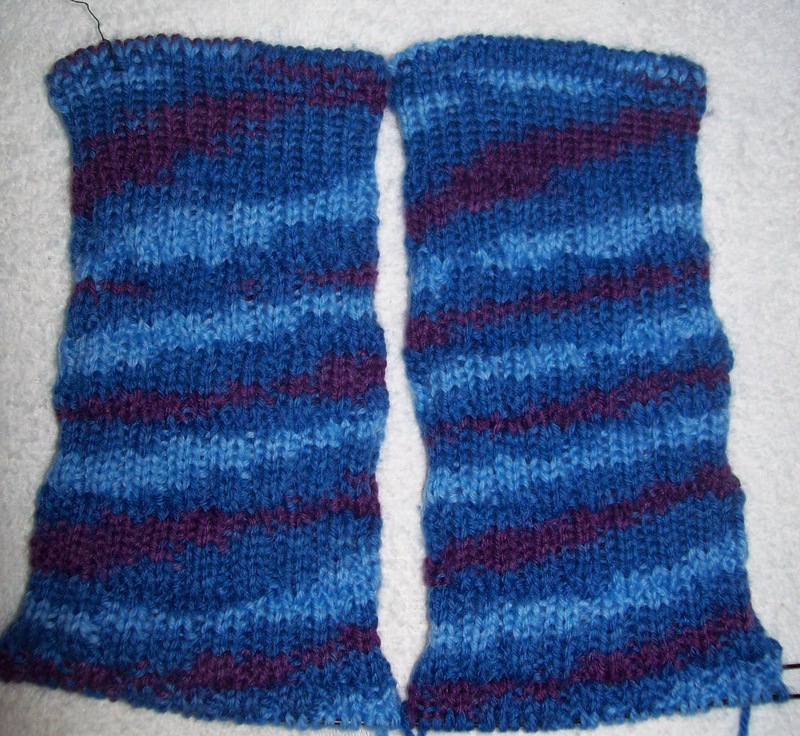 Saturday AM, 7.5 inches, plus a flap and turned heel—No gusset yet, but the stitches have been picked up. Nice progress, if I do say so my self! 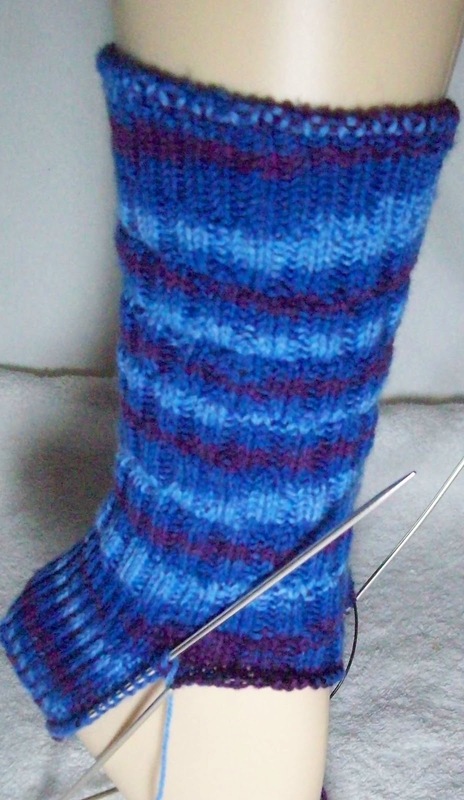 These socks are just so easy to knit. Its almost as if they are knitting themselves. The secret sock hasn't been neglected, either. First they acquired a toe (after the cast on) and then it measure 3 inches, then 4 inches, then 5 inches of the foot knit up. Now the foot measures 6 inches, and soon enough it will be time to do the heel! The secret sock yarn is pretty.. but not exciting. The colors are subtle, the changes are gradual. It's looking lovely but its not very exciting to knit (and the foot is plain stocking knit.) Not even a hint of stitch pattern to jazz it up. Still, progress is being made, so all is well. At this rate, I'll have both my public and secret socks done before too much of the month has passed, and can go to work on something else. Like the scarf I was thinking of, earlier this week. It's going to be a simple scarf—a big (100g) skein of sock yarn, and garter stitch—with a bit of edge for some interest. Eventually there will be matching (not matchy- matchy) socks, just a pair of socks in the same sock yarn/same color way. Go togethers-- rather than a matching set. And continuing a theme, both will match/coordinate with clothing (new-ish, smaller clothing) I own--so they both will be practical as well. It's one of 3 color work socks I have planned for this year. After Kate and Alice will be the dragon socks, and in the fall, rubeckia socks (with home dyed yarn in a rubeckai color way). Well, that's the plan for now, at any rate! Yesterday was a long day—out of the house before 7:30 AM, not home till almost 6 PM. But I got a lot of knitting done, so it was a good day! Interesting how the angle of the swirl changes based on the stitch pattern. It sounds like a wonderful day! I hope you get a lot of beautiful yarn for at the next sale,too.